A primer for researching and choosing paint colors for the historic house. The gasp was audible. On entering the dining room at Monticello in late 2011, the chatter abruptly ceased as the tourists took in the brilliant yellow walls. The hue—chrome yellow, to be exact—produced a stunned silence. “It’s like looking at the world from the inside of an egg yolk,” one visitor observed. The shock was redoubled for repeat visitors since the vibrant yellow replaced a subtle blue that had set the tone of the room since 1936. Why the change? Progress, you might say. Thomas Jefferson liked to be au courant and, in 1815, he got his hands on a supply of lead chromate yellow pigment, invented only a few years earlier in France. The color was fashionable, and few people complained of its intensity in an era when the after-dark illumination of candles and lamps produced the equivalent of fewer than five watts of electric light. Today, the science of paint analysis is providing new insights into early decorative schemes. Just a generation ago, the standard method of determining a paint chronology (that is, the sequence of colors applied to a surface) was simply to scrape, sand, or otherwise expose the lower layers. The colors were usually faded but some had lost their original tones due to sun exposure, oxidation, and the passage of time. One consequence of such studies was the so-called “Williamsburg palette,” the product of early restoration work at Colonial Williamsburg, begun in the1920s. Even today, many people maintain the mistaken impression that our ancestors lived in a world of muted and “tasteful” shades. In the last several decades, however, preservationists at Washington’s Mount Vernon, James Madison’s Montpelier, and countless other historic sites have benefited from the expertise of a new breed of technologically-savvy conservators. They employ cross-section microscopy, organic and elemental lab analyses, and other scientific techniques. The result is that restorers now can “see” what the naked eye cannot by reading the residues of pigments, oils, washes, and other media. By identifying the hues, color saturation, and the lightness of paint samples, paint analysts have produced new understandings of the tastes of the past. 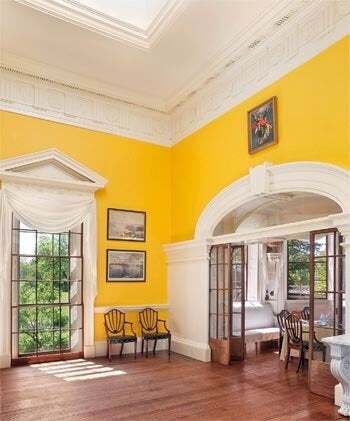 Often the paints historians find are surprisingly bright; many of the colors, like Jefferson’s chrome yellow, were fresh and new in their time. 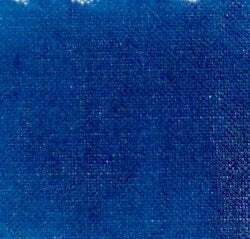 At the turn of the eighteenth century, for example, the first chemically synthesized color, Prussian blue, became wildly popular after a Berlin colourman produced it using a salt compound of iron and potassium. Verdigris green was another innovation, made from a crystal formed by suspending copper sheets in a vat of vinegar. Before chrome yellow was first manufactured in 1819, other yellows were in use, including Turner’s Patent yellow, marketed in the 1780s. Of course, some pigments weren’t new even in the age of the Founding Fathers. Among them were whiting (a form of calcium carbonate), white lead, indigo, and burnt umber. Yellow ochre and traditional reds, including Venetian red and the purplish Spanish brown, were each made with naturally occurring earth pigments in use since antiquity. 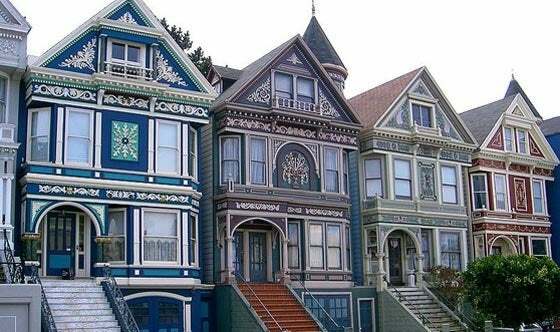 In the nineteenth and early twentieth century, however, the range of choices would expand exponentially, making possible the polychrome paint schemes of the Victorian age, typified by the so-called “painted ladies” of San Francisco. In the pre-industrial era, none of these colors was sold premade in the cans and tins we take for granted. Each painter had to prepare his own paints using dry pigments ground into powders, which were then mixed with liquid media, most often linseed oil. The process was laborious, since the more thoroughly the pigments were ground into the binder, the richer and more uniform the color. Occasionally water-based or even milk-based media were used instead (the latter was often a mix of milk, lime, and Neat’s foot oil). WHAT DOES THIS MEAN FOR MY HISTORIC HOME? Even if you’re an historically conscious homeowner, you’re not required to grind pigments in a paint mill or boil linseed oil in a copper cauldron. If your house has an important architectural pedigree, you may wish to commission a paint analysis, but mainly you’ll want to consider clues you’ve found, such as old paint surfaces located in rarely repainted closets, atop moldings, or that emerged with the removal of old wallpaper. You may even wish to undertake a sand-and-scrape analysis yourself (if you do, keep in mind the colors are likely to be very much faded). Another potential source of guidance is the good work done at many historic sites. Most paint manufacturers have been paying attention to these findings, and the marketplace now has many hues that replicate popular colors from the eighteenth, nineteenth, and early twentieth century. That means old house owners can pay due regard to the historic character of their homes while using convenient water-based paints that offer easy clean-up and shorter drying times. Many of these products are also more environmentally friendly, as low- or no-VOC paints emit fewer volatile organic compounds. Just like Thomas Jefferson did in his day, you get to exercise your taste when choosing paint colors for your home. If you don’t have an existing color scheme you’re trying to replicate, it still makes sense to pay heed to historic precedents. And there is good guidance available to help you choose colors that both please your eye and suit the style and heritage of your home. Check out the Bob Vila’s Guide To Historic Paint Colors slideshow. If you like early yellow houses, Bob tours one in Cambridge, Massachusetts, where both General George Washington and poet Henry Wadsworth Longfellow lived. Consult the Valspar color charts containing the 250 hues identified at National Trust for Historic Preservation sites and marketed by Lowes. 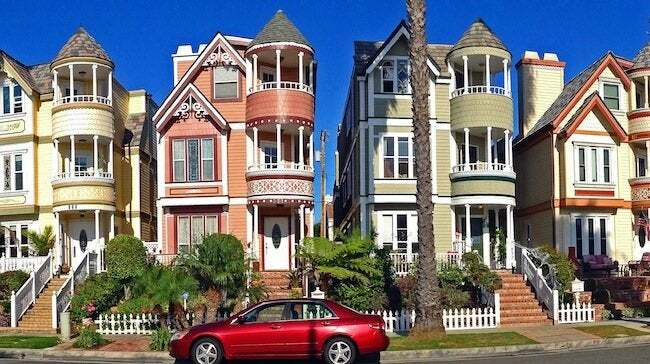 Take a look at the handy color guide from California Paints, prepared in collaboration with Historic New England, which features 149 colors linked to architectural styles dating from the seventeenth to the twentieth centuries. 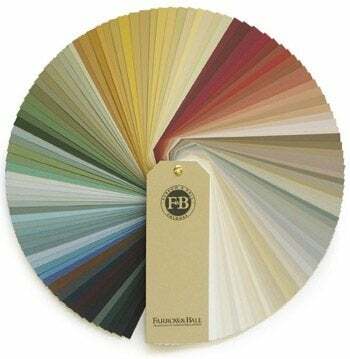 The British firm of Farrow & Ball sells high-quality paints made in small batches; consult their paint selection. What anglophile could resist colors with names like Rectory Red and Manor House Gray? Most major American paint manufacturers produce lines of historic colors, too, from Benjamin Moore’s Historic Paint line to the Pratt & Lambert Williamsburg palette. Hugh Howard’s new book is Mr. and Mrs. Madison’s War, a fresh look at the War of 1812.